Kitchen appliances -- large and small -- completely mystify me. I mean, I think it's all kinds of awesomeness that some inventor took time out of his or her busy day to think up things like immersion blenders, coffee grinders and electric juicers just to make my life a little easier. But I also remain a little mystified by the fact that these monuments of metal blades and plastic repeat the tasks I ask of them day in, day out with, quite frankly, amazing regularity and consistency. Except, that is, for the Keurig coffee maker. It's causing a bit of an a.m. kerfuffle at the Nine-One-Four. Because, morning to morning, we never know which Keurig will show up -- the Good Keurig or the Bad. This is what a Good Keurig Day looks like. We invested in the machine some time ago, having enjoyed its services at a bed and breakfast we stayed at in Seattle. It's a dandy machine. The coffee is piping hot every time. I get to sip my high octane favorites (Zombie Gut Killer! Fry Your Hair French Roast!) while my date enjoys mellower blends with cozy names like Donut Shop and Kitten Whiskers Sumatran. Not really.We've landed on a happy compromise of satisfyingly nerve-tingling (at least for us) Emeril's Big Easy Bold, with (for me) a chaser of Timothy's Decaffeinated Colombian. The combo almost -- and that's almost, mind you -- gets me through a day at the Chambers of Horror office without slapping anybody. That's when you know the coffee's pretty damn good. Just so you know. Coffee calms me. Really. On Bad Keurig Days, coffee is issued in puny war time ration fashion. You select the mug-size serving option -- you get a cup. You select the large mug option -- you get a cup. You want a cup -- miraculously you get a cup. I'm doing this for your own good. You're the one who wanted to cut back on caffeine, you know, the Keurig seems to intone as it finishes dispensing its paltry allotment of morning joe. But, on Good Keurig Days, on Good Keurig Days, the java flows generously -- like the last days of Pompeii. And did I mention? 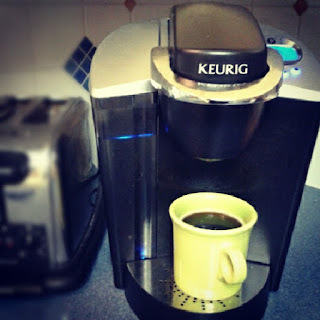 Good Keurig Days can, and do, occur in the middle of Bad Keurig Days. And vice versa. Welcome to my world. Is there possibly a larger metaphor at work in all this? We've followed all the proper care-and-feeding instructions in the owner's manual and sacrified small mammals to the Good Keurig Day Gods (Chill, PETA. Not really. But there are a couple cats in the neighborhood that are on the short list.). I've Googled Good Keurig/Bad Keurig for help. We've joined a Survivors of Bad Keurig Days support group. But the capricous Keurig prevails. And rules the kitchen. And us. Damn machine. Good thing the coffee -- no matter the serving size -- is delicious. And piping hot. Could this be why I use instant?